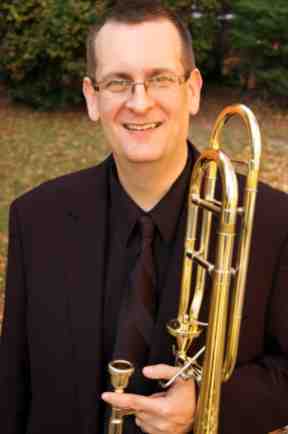 Dr. Jonathan Whitaker, Assistant Trombone Professor at the University of Alabama, presented a masterclass during Trombone Seminar on October 11, 2012. Dr. Whitaker performed three of Jean Michel Defaye’s pieces in the styles of Debussy, Stravinky, and Vivaldi. Following his performance, Dr. Whitaker coached two of the members of the trombone studio. In addition to the masterclass, Dr. Whitaker taught several private lessons to members of the studio. We all learned a lot and got some great ideas for the future. Thanks for visiting the University of Iowa!